The Lost Property Office of the London Underground has been in existence for almost eighty years and is one of the largest departments of its kind in the country. Around 200,000 individual items of lost property are handed in every single year by commuters using all of the services operated by Transport for London. The underground system seems to spawn the bulk of the items that are brought deposited in the many shelves of the lost property store, and range from the run of the mill, mundane items that you might expect people to leave behind, like umbrellas and jackets, through to the extra ordinary items you don’t expect to see like false limbs and transplant organs. Books seem to remain the most popular item to be left behind by passengers, and the books that are handed into the lost property offices are a reasonable indicator of just what the nation is reading at any one time, in fact it is probably a more accurate reflection of the nation’s tastes than the top ten best seller lists. There are a staggering 40,000 books left on the transport system every year, and that remember, is just in London. At any one time there must be a full library’s worth of books travelling abandoned and neglected around the city. Other than the thousands of books that are left to travel alone the next major property categories are bags and clothing. Normally we guard all of our bags when we are travelling, wary that some unscrupulous individual may try and sneak them away from under our noses, yet when we take a bus ride or hop onto a tube train all of the worry over our personal belongings seems to disappear and we happily walk away from the vehicle leaving everything that we value behind. Bags containing purses, wallets, house keys and all of the things that we are so guarded about are left behind in a moment of forgetfulness. Thankfully the staff that work in the lost property office are very adept at returning such items to their owners. It seems appropriate that at their office at 200 Baker Street, the staff at the LPO have named the computer system that is used to log all of the lost property after their infamous if fictional neighbour. Sherlock is used to log every individual piece of lost property that is handed in, and can offer details of some of the more peculiar items that have passed through their doors such as the strange stuffed puffer fish, the abandoned lawnmower, the lost and lonely breast implants and the eerie human skull. 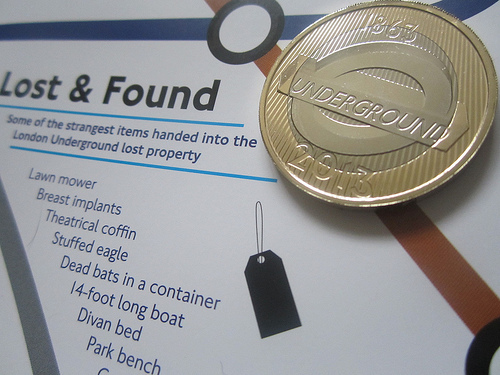 The staff themselves are required to adopt the role of detective in order to reunite commuters with their property, a job that is made just a little easier when something is handed in with the owners identity inside. However the staff have been known to go above and beyond the call of duty on occasion in order to reunite property and owner managing to track down the next of kin of two urns of cremation ashes that had been in their vaults for years. Looking to take a trip to London? Why not travel in-style with a London Chauffeur from Ultimate Chauffeurs?